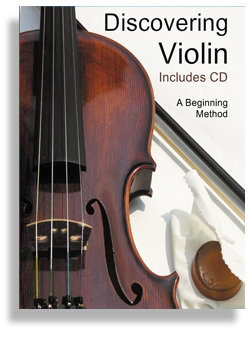 Discovering Violin Book and CD is a revolutionary approach towards learning how to play the violin by Danielle Cummins. This Complete (96 pg) Method is designed to teach a beginning violinist proper technique in a logically progressive manner. The sole objective is to encourage students to develop a passion for music. We have included an instructional performance CD to make practicing fun, rewarding and productive. Each piece is designed to take a student on an inspirational journey by discovering the beauty of music and its purpose. This adventure in learning will benefit both the student and teacher. Get ready to begin an exciting adventure. Experience the incredible satisfaction of learning how to play the violin. Begin to see the world from a whole new perspective, the world of musical sound. Gain new skills which will provide the ability to communicate through both visible and invisible means. This is the joy of musical sound. Playing violin is a rewarding process that requires diligence, perseverance, creativity and humility. Music is a mirror of beauty, truth, knowledge and imagination. A gradual step by step process is the best approach towards achieving excellence. Practice sessions must occur on a regular basis and follow a daily disciplined schedule. Practice sessions do not need to be long and tedious; they just need to be consistent with focus. Don't be afraid to leave something for tomorrow. The anticipation towards the next day's workout is as beneficial as the work itself. The ultimate goal is to aim for just a little progress each and every day. Be sensitive towards your physical limitations as everyone's tolerance is a bit different. Pay close attention to your body and know when to take a break, preferably before your muscles become sore. Remain as relaxed as possible whenever playing and remember to always breathe naturally. Be generous when playing for an audience and cherish the ability to share the gift of music to all.